When Mies van der Rohe set out to remake the world in the image of a crystal-clear tower with steel columns behind walls of glass, he probably wasn’t thinking about dressing up those buildings with old-timey hats and handlebar mustaches. However, a century later that’s exactly what’s happening in Cincinnati. The Queen City’s 468-foot-tall Scripps Center, a 1990 office tower resembles any Midwestern skyscraper with a curved wall of glass keeping watch over the Ohio River. But thanks to red, white, and black colored panels applied to the top of the tower, the building now looks a little like the Cincinnati Reds’ mascot, Mr. Redlegs. Mies would probably loathe this decorative approach to giving buildings character, but it’s not 1921 anymore, Ludwig. The Reds gave the building a pillbox hat and mustache in celebration of the 2015 All-Star Game, which will be played in July at the city’s Great American Ballpark. The panels are made of the same material that is sometimes used to put advertisements on buses. 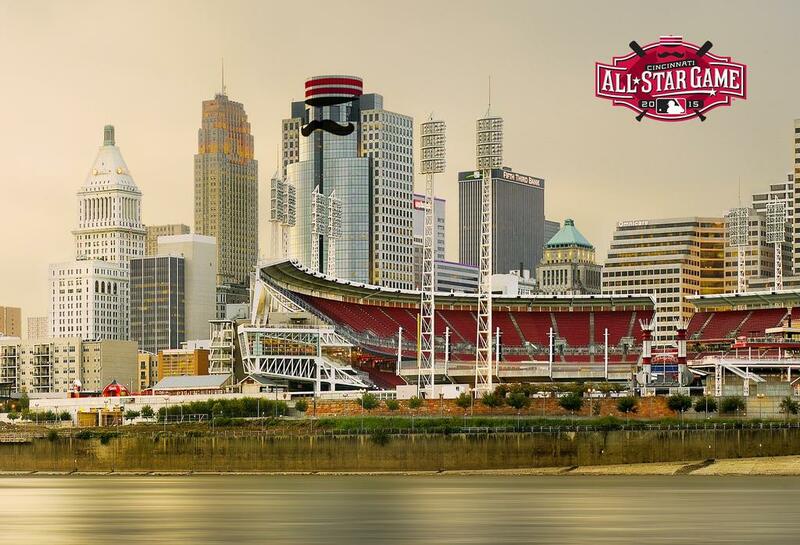 In anticipation of the game and its parallel festivities such as the Home Run Derby, the city is pulling out all the stops, including shutting down part of a freeway and projecting images on the nearby Carew Tower, one of the city’s most iconic structures. 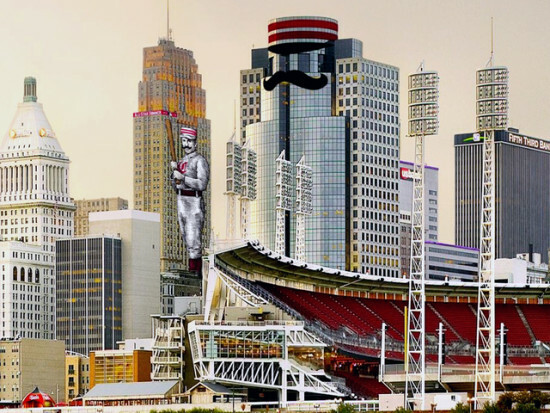 And all throughout the city, 850-pound sculptures of mustaches are being decorated in baseball-themed art.